Burn DivX to DVD/ISO/DVD Folder/Blu-ray DVD Easily. Edit DivX Videos before DivX to DVD conversion. Customize DVD template for DivX to DVD. Are you looking for a great DVD creator no watermark to burn your DVDs? On the market, there is hardly any free and reliable DVD creator that is able to burn DVDs without watermark. Almost all smart DVD creators without watermark are the paid ones. 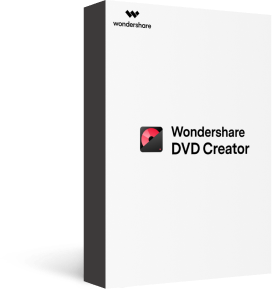 However, Wondershare DVD Creator (Wondershare DVD Creator for Mac) stands out of the crowd because of these features below. It always runs stably and supports nearly any operating system, including the newest ones. 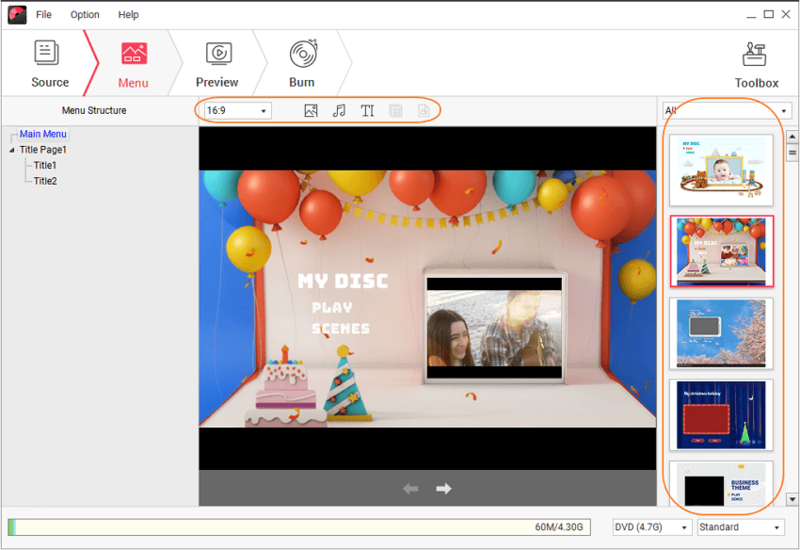 What's more, it lets you quickly and easily burn almost any video to DVDs (including DVD folder, .dvdmedia, iSO), say, burn AVI to DVD without watermark, MP4 to DVD without watermark, etc. With a great many of free DVD menu templates provided by this great DVD maker no watermark, you can burn a professional DVD effortlessly even though you're not a Pro. Above all, the output quality is very great. But note that the trial version you download here still leaves a watermark on your new DVD. This smart DVD maker without watermark will work normally as long as you've paid it. The whole DVD burning process just needs three simple steps. · Burn videos and photos in any format to DVD/ISO/DVD Folder/Blu-ray DVD without watermarks. 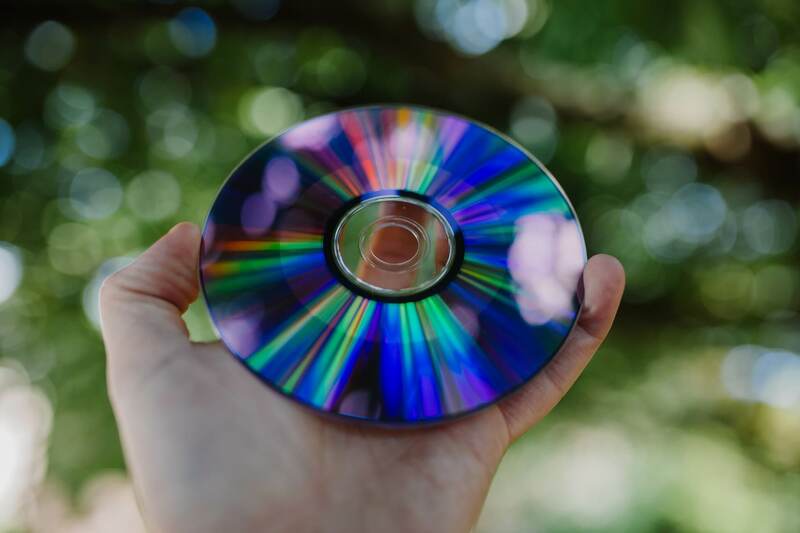 · Additional tools to burn Data disc, convert ISO to DVD, make photo slideshow, copy DVD, convert DVD to video, one-click to burn Blu-ray disc, etc. 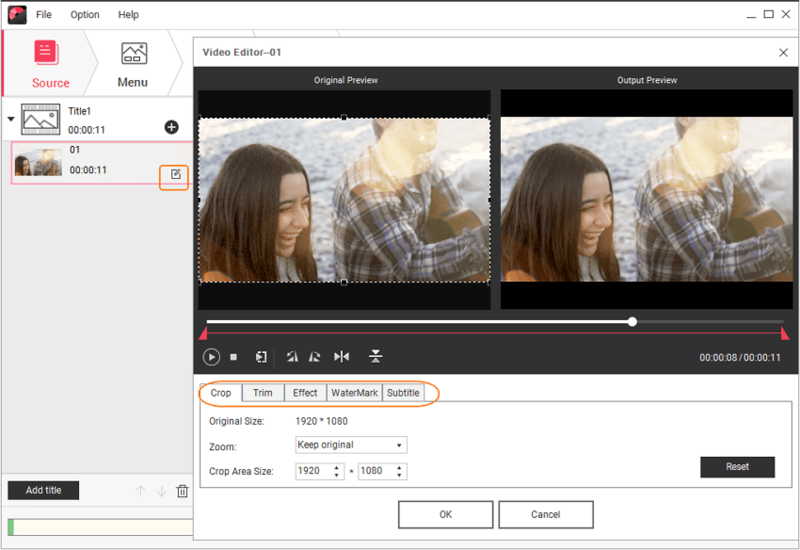 · Built-in editor to personalize videos by Trim, Crop, Add subtitles, Apply effects, etc. · Customize DVD menu by changing background picture and music, adding text, editing thumbnail, and creating chapters. · Select a menu templates from 100+ free static and dynamic designs with Standard, Sport, Memory theme. · Create videos to DVD with high-quality output and fast speed. Install and launch the DVD Creator, then choose Create a DVD Video Disc option. You will get an interface with the + icon in the center, click it to add videos present on your PC. Another way to import videos to the program easily and quickly is simply drag and drop the desired files. All loaded videos will be displayed as thumbnails on the left of the interface. If you want to change the video order, just select the video and click or . Hit the Add title button at the bottom-left side to create new title page. Click the pencil-like icon on the thumbnail to open the Video Editor window. 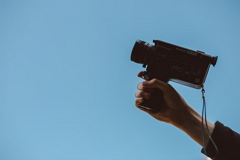 You can make changes on the video such as Crop, Trim, Effects, Subtitle, and others. Feel free to skip this step if you want to keep your videos original. Move to the Menu tab to choose a favorite template design from the right column. Click the icons at the submenu to customize your DVD menu further by changing background music or picture, adding text, adjusting aspect ratio, etc. Switch to Preview tab to check all your creations, back to the previous options to make adjustments if there are something you're not satisfied. Then go to the Burn tab and insert a blank disc into your PC. Choose Burn to disc option and finish Burn Settings such as Disc Label, Burner, TV standard and more. Finally, click the Burn button to start burning videos to DVD without watermarks. Note: This intelligent DVD creator no watermark supports DVD-R, DVD+R, DVD-RW, DVD+RW, DVD+R DL, DVD-R DL, DVD-RAM. And it is able to compress all the added video files automatically to fit the DVD if the size of these files is more than your DVD storage capacity.